SIP 08916 Petrol Pressure Washer. The high quality 5.5hp petrol Honda engine provides excellent and reliable power with 160bar maximum bar pressure this SIP 08916 model has a 76800 cleaning power (maximum pressure x water flow rate). Fitted with a Comet LWD-K self-priming Triplex pump with ceramic pistons and brass head pump for a high quality finish. Designed to take a cold water feed this pressure washer has a 120 litre polyethylene water tank. With regulated low-pressure detergent suction, suction filter which is readily serviceable at pump inlet and professional unloader valve. 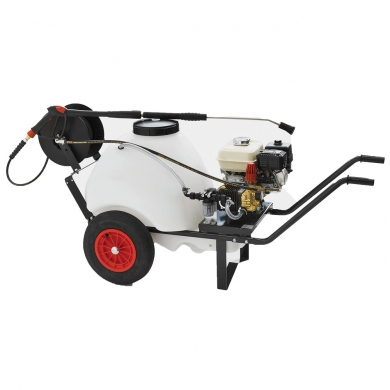 Built on puncture proof wheels making this petrol pressure washer easy to move around and suitable for use on uneven terrain where other models may fail. The 2 handles allows you to grip the pressure washer to move where required with ease. Comes with a GH301 spray gun with swivel connector, bent lance with detergent head (without nozzle), fan shaped nozzle and a 15 metre G1/4 hose with hose reel.